I've never been much of a fan of Ryvita, all sounds a bit too much like health food. Dry and flavourless were my automatic reactions. My flatmate used to love them and live off them, but I can't say I was too enamoured with the idea. A couple of weeks ago, Ryvita asked to send me a package, which unfortunately arrived the day after I left for a two week holiday. The cheese sat on my desk for the duration, and although it tried to last, I didn't want to risk. 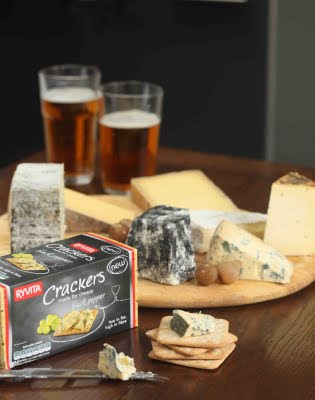 I did however try the black pepper crackers that came with the cheese and I am pleased that they greatly exceeded the Ryvita stereotype I had in my head. A good foil for a lump of cheese, with a slight pepperiness. A nice alternative from other more traditional crackers.